Railway Board, Rail Bhawan, New Delhi — 110001. 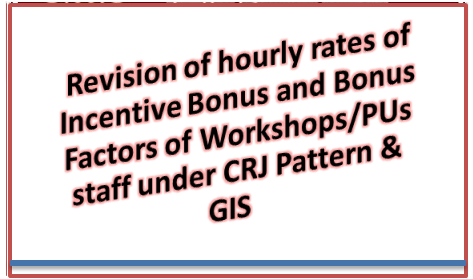 With reference to our earlier memorandum and our meeting with you on 04.07.2018, we submit this memorandum for the kind consideration of the Committee for revision of hourly rates of Incentive Bonus on estimated additional expenditure on account of revision of incentive rates based on minimum pay of respective Pay Level in 7th CPC Pay Matrix divided by 208 (standard working hours per month) — as per formula followed after 5th Pay Commissions. If incentive rates are revised based on minimum of respective Pay Level divided by 208, additional expenditure is estimated to be Rs.214.09 crore. In terms of equivalent man power it will be 3,061 Group ‘C’ & ‘D’ workshop staff (2,847 men in Group ‘C’ and 213 in group ‘D’). This will be only 1.28% of 2,19,682 strength of Group ‘C’&`D’ workshop staff available in Indian Railways as on 31.03.2017. Details of the calculation is attached in Table-2. It is therefore requested that, no reduction in allowed time / man power may please be proposed for implementation of revised incentive rates, since the estimated additional cost equal to only 1.28% man power which will be compensated by additional work load due to the addition of rolling stocks & new trains. Estimated additional expenditure on account of revision of Incentive Rates based on minimum Pay in Pay Matrix divided by 208, standard working hours per month Basic Pay at 20th cell of respective Pay Level in the Pay Matrix Estimated additional expenditure on account of revision of Incentive Rates based on minimum Pay in Pay Matrix divided by 208 (standard working hours per month) will be Rs.214.09 crores. In terms of equal man power it will be 3061 (2847 men in Group ‘C’ & 213 in Group ‘D’) @ average per Capita staff cost for Group ‘C’ work shop staff Rs. 7,09,474 and average per capita staff cost for Group ‘D’ work shop staff Rs. 5,66,147. This will be 1.28% of 2,38,546 strength of Group ‘C’ & ‘D’ workshop staff available in Indian Railways as on 31.03.2017.